I think I’m just really in love with women, and I love to see them looking incredibly, truly beautiful. I think every time a woman wears one of my dresses, you know, in a matter of speaking, I’m having a little love affair with her! Politicians also have a love affair with the ‘small business exemption.’ Too much paperwork? Too heavy a burden? Not enough time? Just exempt small businesses from the rule. It sounds so pro-growth. Instead it’s an admission that the costs of a regulation just can’t be justified. The thing with movies is, because you have so little time, I always feel like there are more things we could’ve done with the character. 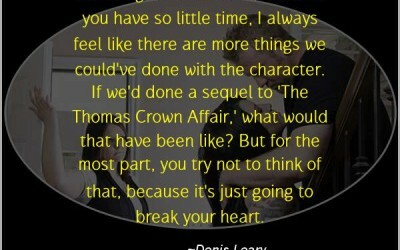 If we’d done a sequel to ‘The Thomas Crown Affair,’ what would that have been like? But for the most part, you try not to think of that, because it’s just going to break your heart.